Miriam Posner, Digital Humanities program coordinator at UCLA and guest curator at the NLM, on what led a 1920s Brooklyn surgeon to remove the veins from a day-old infant, mount them on a board, and film them being pumped with air. As a historian of medicine’s visual culture, I’ve seen some weird films. 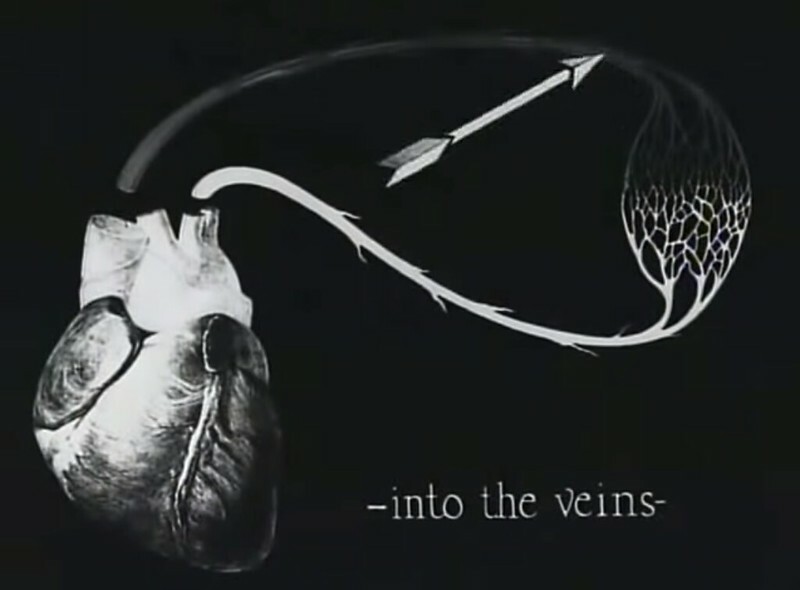 But The Blood Vessels and Their Functions (1924–1925) still took me aback. What would possess someone to mount an infant’s veins on a board and inflate them with air? The Blood Vessels and Their Functions is one reel of a six-reel series, The Human Body in Pictures. Brooklyn surgeon Jacob Sarnoff (1886–1961) produced this movie atlas of the human body between 1920 and 1924. Sold alongside a textbook and slides, the series was designed as an education tool for physicians-in-training. For The Blood Vessels and Their Function, he attempted a cinematic first: to dramatize the workings of the heart, he removed the veins from a day-old infant, mounted them on a board, and devised an air-pumping system — which he termed “Pneumo-Viscera” — to push air through the circulatory system. Sarnoff was no dabbler. A busy surgeon who helped found Brooklyn’s Maimonides Medical Center, he spent some $8,000 to $10,000 a year on his filmmaking activities: “practically all my earnings, with the exceptions of what I had to spend to live on and to support my family.”1 And he was prolific: his System of General Surgery in Motion Pictures (1932), the series that succeeded The Human Body in Pictures, included more than 200 reels depicting 300 operations. While it struck me as strange, The Blood Vessels and Their Functions makes a certain kind of sense. Sarnoff wanted to show the entire vascular system, and the system in its entirety is simply not viewable in situ. He had to lift it out of the body to show how blood vessels connect to each other. 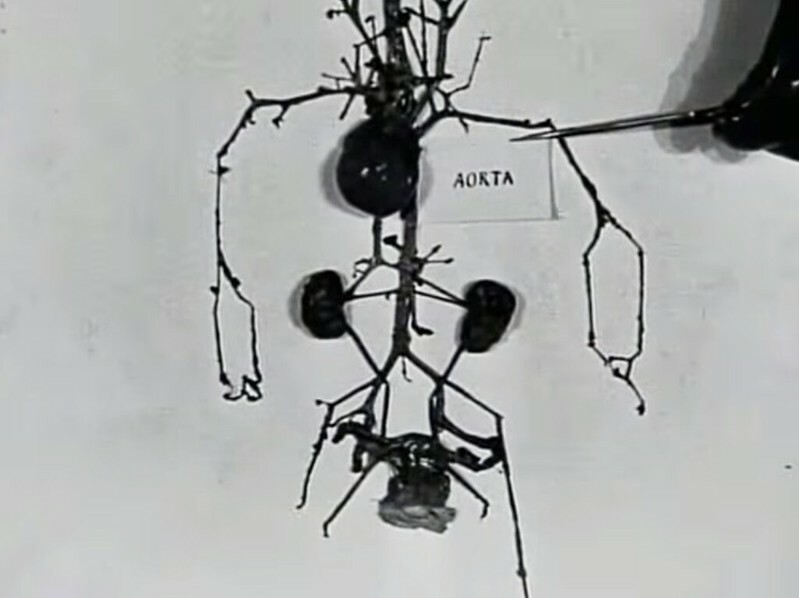 A still from the film showing the day old infant’s veins mounted on a board. A still showing one of the animated diagrams from the film. Sarnoff’s “Pneumo-Viscera,” his technique for inflating veins, helps to schematize the human body, much as animation does, by turning human flesh into something akin to an animated diagram. And it connects the pieces, too. As the air travels through the veins, the viewer can see how the pieces of the human body are linked together. 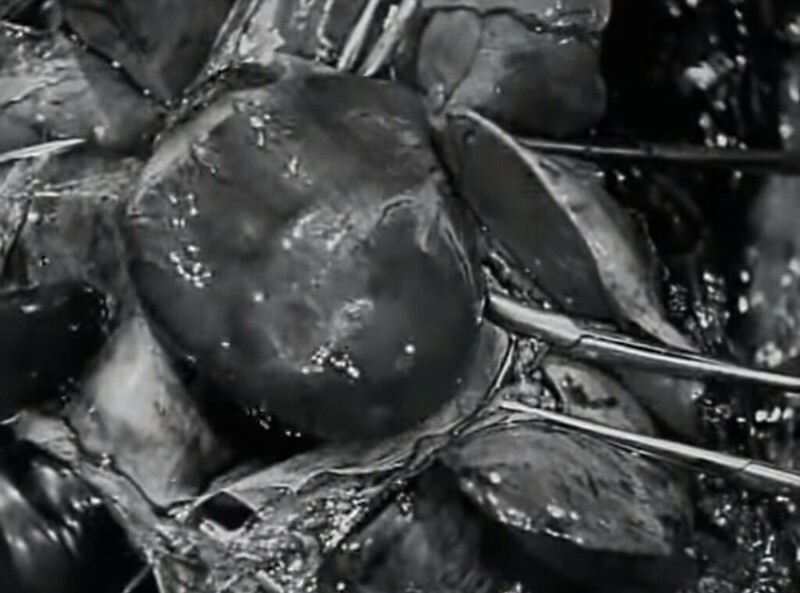 For surgeons like Sarnoff, the value of film wasn’t only, or even chiefly, its ability to mechanically reproduce reality, but its ability to function as a dynamic collage: to offer students of surgery a lesson on how to move back and forth seamlessly between the messy substance of reality and the neat diagrams that populate anatomical atlases. A still showing the messy scene at the site of a beating heart. In fact, medical illustrators had been producing collages like this for centuries, in the form of the translucent vellum diagrams that overlay more realistic depictions of the body in anatomical atlases. But with film, Sarnoff and his fellow filmmakers could now add the element of motion to these anatomical collages. The Blood Vessels and Their Functions has even more to teach us about the act of capturing human anatomy on film. Sarnoff aspired to produce not just any set of films, but a definitive atlas of the human body in motion. In Sarnoff’s imagination, medical educators would turn again and again to his film reels to demonstrate how the human body works. It makes sense: the body, presumably, is universal and timeless. Once images of it are secured, why should we ever need new ones? And yet The Human Body in Pictures quickly faded from use, as did every other medical movie. The films of the Surgeon General’s Library, now the National Library of Medicine, are valuable for what they can tell us about history more than they are for contemporary medical education. 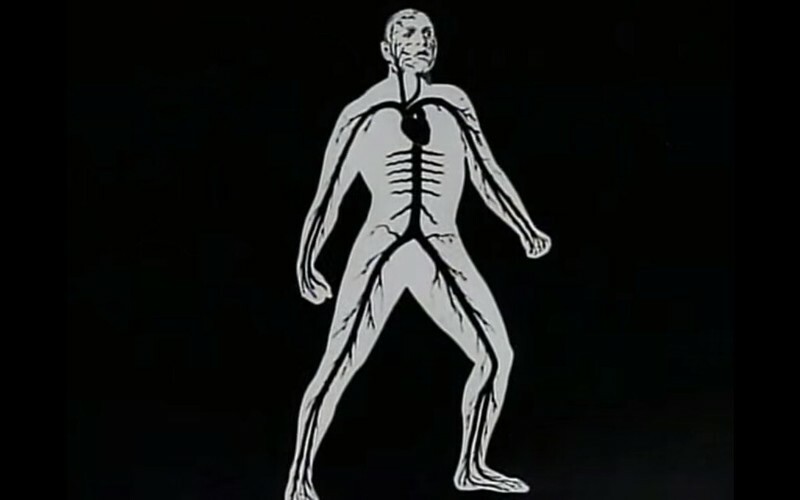 A still from the film showing an animated depcition of the circulatory system. So why do Sarnoff’s films now seem dated? Certainly our imaging capabilities have improved: the endoscopic camera takes us deeper into the body’s orifices than Sarnoff could have imagined. But also, as Scott Curtis puts it, moving images of the body’s interior have turned out simply not to be as useful as filmmakers once assumed; they are “temporal and ephemeral, hard to read and difficult to grasp.”9 Film makes it easier to connect the parts of the body together, but that very fluidity and motion also makes the body more difficult to apprehend. Parts of the body slip in and out of view, and we find ourselves frustrated by our inability to see how one part is connected to the next. That’s why Sarnoff extracted the infant’s circulatory system: to gather the whole system in one frame. To make sense of human anatomy, we seem to need to freeze it, disconnect the pieces, and manipulate each one individually. It’s too much to take in all at once. Contemporary digital anatomical atlases still make use of moving images, but they tend to be framed with text and still images. On its own, a moving image seems to tell us too much. The films of Jacob Sarnoff are now relics of a bygone era. They can say volumes about the human body and how it works, and even more about the aspirations, ingenuity and technical problems of the people who made them. It’s just that those lessons aren’t necessarily those that its creator intended. Miriam Posner is the Digital Humanities program coordinator and a member of the core DH faculty at the University of California, Los Angeles. Her Ph.D., from Yale University, is in Film Studies and American Studies. This essay is adapted from: Miriam Posner, Depth Perception: Narrative and the Body in American Medical Films (University of North Carolina Press, 2016), and first appeared on the NLM’s “Medical Movies on the Web”. For more films in the NLM’s collection, and a great series of related essays, see their “Medical Movies on the Web” project.